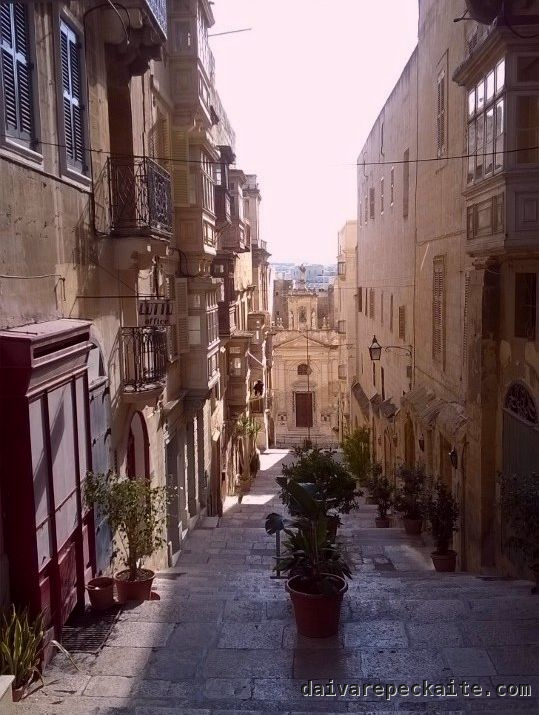 In Malta, just like in Cairo, sidewalks are a buffer between buildings and streets, not a safe space for walking. They are used for parking cars, disposing of trash, displaying goods and so on. Often they are littered with leaves, bird and dog feces almost like in Paris, or slimy with moss. Apart from Valetta and touristic areas, few people walk, since most try to move around by car. Cycling is out of the question – too dangerous on the narrow, car-filled roads, too little space on slippery sidewalks – which sometimes disappear altogether abruptly. I have no idea how wheelchair users move around. Surely they must own cars or rely on others. Then again, it was very similar in Cyprus and in Bethlehem. So I guess there is something about car-focused Mediterranean cities. This leaves Valetta as still my favorite town, although I have seen more towns by now, and most of them are cute. Without noticing, I breathe a sigh of relief each time I enter Valetta. Its logical grid of parallel streets, its broad promenades and clear street name signs make me very comfortable to be there.